Throughout the winter months, my CSA share occasionally provided popcorn on the ear with instructions about how to prepare the snack in a microwave. It seemed easy enough: put the ear in a paper bag, tape the bag shut, nuke it. Not having a microwave at home I ended up with a bunch of ears, but today I had a brainstorm: I could bring a them to the office and make popcorn for everybody. I headed to work armed with the sea salt, butter and corn, sure that I was going to make my coworkers' days by providing a fun and tasty snack. No so much. I placed the corn in the bag, reminding myself that folks put paper towels in the microwave all the time, so it must be safe. I was actually more worried about the tape, to be honest. I put the bag in the machine, set it for three minutes, and stood there listening for the inevitable explosive noises of popping. After 30 or 40 seconds I sniffed the air and decided that something wasn't quite right. I hit stop, opened the door, and noticing smoke coming from the bag, decided to throw it in the sink and douse it with cold water. Lucky. Parts of the bag were scorched. If I hadn't taken it out, I'm pretty sure it would have caught on fire rather quickly. I'm thanking my lucky stars that I didn't walk away or use the restroom while I was waiting. In any case, the office smells unpleasant and I don't have a tasty snack to help me smooth things over with my coworkers. I sent an email to Pete's Greens suggesting that they let their other shareholders know that the whole paper bag + electromagnetic waves = potential burning down of the building. I'm feeling a little shaky...not sure if it's the smoke inhalation or the knowledge that I could have set off the sprinkler system in our building. What a bad start to the afternoon! Regular and even irregular readers of this blog may have noticed that I, um, haven't been around much lately. In an earlier excu..post, I mentioned that I've been working on a major project and had started a new exercise regimen. Recently, I even added house-cleaning to my roster of daily activities, much to my s.o's relief. All of these activities have caused my blogging to come to a screeching halt, save for a few yogurt-related posts. Anyway, I'm writing today to say that the four-month project which involved the creation of the 2008 7 Nights Guide to Restaurants and Bars ended last Friday, and as of today, I'm back to my rigorous blogging schedule. But before I start talking about new kinds of yogurt or weird food news, I want to put in a plug for the forthcoming "Dining Guide." 7 Nights is two different things: It's an online site that encourages diners to comment on their eating and drinking experiences and it's a magazine-style publication that we release each May. This year's print edition will have more than 700 places to chow down in the Green Mountains, and includes listings from two regions of Vermont we've not included in past editions -- the Northeast Kingdom and the Upper Valley. Each restaurant listing includes the days that a restaurant is open and which meals are served, phone number, price range, a brief description, and more. So, if you haven't already, sign-up for our online dining guide, become a member of the 7 Nights "Bite Club," and look for our '08 guide in mid-May. And look for my next blog post tomorrow! Packaging: Pretty simple. The background is mainly green, and there's a, well, maple colored stripe around the bottom. There's also a simple drawing of a black sheep, which is cute and slightly creepy at the same time. Why creepy? The sheep's eyes kind of look like they're glowing, which gives it the appearance of an evil zombie sheep. On the back there's a good amount of information about the farm's yogurt-making practices. They use all-natural ingredients and manage the farm organically, for example. There's also a note about the fact that sheep's milk is easier to digest than cow's milk. Nutrition Info: 6 oz. serving. 160 calories. 12% fat (DV). 0 g. fiber (DV). 11 g. sugar. 8 g. protein. 6% vitamin A (DV). 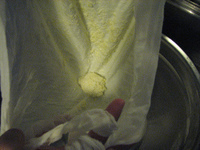 3% vitamin C (DV). 29% calcium (DV). 3% iron (DV). Active Cultures: L. bulgaricus, S. thermophilus, L. acidophilus, Bifidus. Appearance: Pretty white, with some whey off (that means there's liquid hanging around atop the yogurt). Around the edge there are some bubbly markings. Aroma: A pleasant "ferment-y" smell. Mouthfeel: Of the non, non-fat yogurts I've tried, this is the lightest. It has a lovely (yet fleeting) silky mouthfeel. At the bottom of the container the texture became inconsistent. I stirred it up, but there were a few small blobs. Taste: It may sound strange, but the first word that comes to mind is "effervescent." Yes, I know that's a touch descriptor, but what I mean is that it is tangy in the same way that carbonated beverages are tangy. It's slightly sour without being at all pucker-y. The maple flavor isn't very strong. Notes: I appreciate the nutritional profile of this yogurt: It's neither super-decadent nor non- or low-fat. And it doesn't have a lot of sugar. And for those who can't tolerate cow's milk, this could be a great option. Overall, I like it, I'd buy it again, but I won't lust after it. Packaging: First of all, I hate the name. The container tells me it's pronounced "Fa-yeh," but in my head I pronounce it "fahj," which makes me think of high school biology...remember bacteriophages? Maybe I'd take more favorably to the name if I knew what it meant? And then there's the object itself. To me, the packaging shouts "hey, I'm mass produced!" Maybe it's because the container is an unusual shape: There's one cup for the yogurt and a second, smaller container for the honey. I would have been cool with the honey in the same compartment in an effort to save plastic. And the fact that they call the yogurt "Total" reminds me of names such as "Special K" and "All-Bran:" I think they're all trying too hard to sound healthy. But the image of a honeycomb and one of those wooden dippers is evocative and pleasant. Nutrition Info: 5.3 oz. serving (does that include the honey? Although the serving size is smaller than the two other products I've sampled, the container feels heavier. Maybe it's all that extra plastic?) 250 calories. 18% fat (DV). 0% fiber (DV). 28 g. sugar. 8 g. protein. 10% calcium (DV). 10% vitamin A (DV). Appearance: White and creamy. The package advised me not to stir, so I didn't at first. Later, while eating, I did stir it. Nothing bad happened. The amber honey looks just like...honey. Aroma: Slightly sour but pleasant and dairy-licious. The honey is very fragrant and sweet smelling. No I can't tell what flowers it comes from. Mouthfeel: The creamy layer on top is denser and fattier feeling than the lighter stuff beneath, but both have a nice, clean mouthfeel that doesn't linger too long after you swallow. Some yogurts can really coat your tongue. The honey is thick and sensual. Taste: Very, very pleasant. The yogurt is rich and barely sour. And when it's mixed with the honey, it's even better. This tastes almost as good, if not as good, as the Liberté. Notes: There's no wrong way to eat a Reese's, and there's probably no wrong way to eat this yogurt, but there are several possible methods. 1) Dip each spoonful of yogurt in the honey. I don't like this method because the pristine honey gets white swirls in it. Perhaps I'm strange? 2) Spoon out the entire honey cup onto the top of the yogurt, and dig in. 3) Same as #2, but blend the honey in. 4) Drizzle the honey onto the yogurt a little bit at a time. In any case, though, there was too much honey for the amount of yogurt. I know Americans like things sweet, but this much sweetener is kind of ludicrous. And I have a feeling that people won't save up the dribs and drabs for other uses, so I'm guessing that a lot of it goes to waste. Or maybe people just eat super-sweet yogurt. Packaging: The packaging for this product is fine. Writing on the white, plastic cup is in purple, black and blue, and there's a very simple drawing of plums and walnuts with a blue swirl above it. It doesn't get me excited, but it doesn't turn me off, either. It's labeled free of rGBH. The product is made in Canada with milk from the St. Albans Creamery Cooperative in Vermont. Nutrition Info: 6 oz. serving. 250 calories. 22% fat. 0% fiber. 24 g. sugars. 6 g. protein. 20% calcium, 20% vitamin A, 4% vitamin C.
Appearance: White and thick, the consistency of really dense whipped cream. The plums and walnuts are on the bottom. When mixed into the yogurt, the whole turns a very pale purple with bits of walnut strewn throughout. Aroma: This product has a nice, sweet, milky aroma with just a hint of sourness. When the fruit is mixed in, it smells like plums, too. Mouthfeel: Thick, but not too thick, and very pleasant. The fruit mixture alone has the consistency of applesauce with nut bits mixed in. Those who don't like chunks in their food may be turned off by the walnuts. Taste: Completely delightful. The yogurt itself is slightly sweet and tastes like cream, with the smallest hint of sourness on the finish. The fruit and walnut combo is intensely plummy. The walnuts add textural interest -- if you like that kind of thing. -- but not much flavor. Overall, I can't imagine many things I'd rather eat. Notes: Some may balk at the calorie content or the amount of fat in this product: Don't. Please. Fat and fiber help make you feel full. When I eat low-fat yogurt with no added fiber (yes, some yogurts are "enhanced" with a fibrous ingredient called inulin, which is often extracted from chicory plants), I want to eat again in about 10 minutes. The Liberté. on the other hand, actually fills you up. Sorry for being a Liberté proselytizer, but this is the first yogurt that I've ever loved. Visit the Liberté website, here. Now, I see customers standing dumbstruck before the yogurt shelf, not knowing whether to reach for full-fat sheeps' milk, low-fat cows' milk or even a soy facsimile. So, I figure, it's time for a massive yogurt taste test. You ready? Packaging: Very nice. 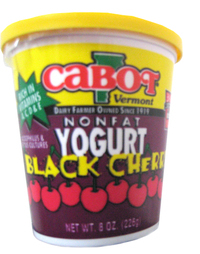 The flimsy, white plastic container is covered with a striking, recyclable cardboard wrapper, which has a white background and black type in a simple font. There's also a rustic line drawing of the fruits that flavor the product. On the side, there's an unusually long list of what's not in the yogurt, including rBGH, preservatives and corn syrup. Plus, it boasts, the milk is from grass-fed cows. It's made in New York State, so it doesn't have to travel too far. This is probably the most dramatic yogurt label I've seen, and I was pretty amused while examining it. A note from Siggi reads: "...we absolutely don't use any artificial sweeteners like aspartame; I shudder at the mere thought." Appearance: Thick and "creamy" looking, white. No whey off. Aroma: Sour enough to make one's nose tingle a tiny bit. Barely there fruit. Mouthfeel: Thick without having a fatty mouthfeel (I like the fatty mouthfeel). The texture is strange to someone used to fatty, whole-milk yogurt. Taste: First note is a bitterness that strikes me as unusual in yogurt, followed by a puckery sourness and then, finally, a hint of sweetness. The fruit flavors are not readily apparant, here. I wouldn't have guessed passionfruit or pomegranate in a million years. There's no "jam" on the bottom of the container, although I kept stirring, just in case. I didn't find it pleasant, but it wasn't particularly unpleasant, either. Not something I would eat for the pleasure of it, but possibly would because it's good for me. Maybe. Notes: The non-fat yogurt is unusual because it's made from milk that has had all of the fat -- and much of the water -- removed. This gives it a remarkably thick texture for a non-fat product, and I thought the process was worthy of mention. Do You Wii (or WOW)? Are you a whiz at whipping up fried gyoza and meat pies for Cooking Mama, or preparing gooey spider cake and curiously tasty omelettes in WOW? Do you spend hours plucking pumpkins and grapes for your potions in The Elder Scrolls: Oblivion? Do you do something fun with food in Second Life? If you do, I need your help. I'm working on an article about virtual cooking, and would love to chat with a few Vermonters who like to stir things up in cyberspace. If you're willing, send me an e-mail that includes your name, contact info (phone numbers are very helpful) and the type of virtual cooking you do. 1) Mixed beef chunks and pork fat in a large container. 2) Added salt, sugar and grated nutmeg. 4) Ground the spices into the meat. Mixed the beef by hand to distribute the spices evenly. 5) Put the meat and three cloves of garlic through a grinder. allow the sausage to safely turn into salami. 7) Put the meat mixture through the grinder again. 8) Kneaded the meat to ensure an even texture throughout. 9) Slid a length of casing onto the spout of an extruder. 10) Squeezed the meat into the casing. 11) Twisted the casing between the links to form sausages. 12) Pricked air bubbles in the sausage with a pin. 13) Hung the sausages to dry. I cooked some of the seasoned meat that didn't make it into the casing, and it was amazingly good. I have high hopes for the salami...In a few weeks, I'll let you know how it turned out. There's nothing like sticking your hands into a warm bowl full of squishy cheese curds. 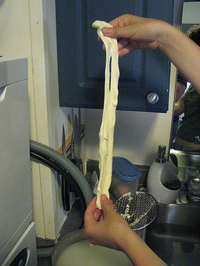 Last Saturday, I experienced this firsthand when I made mozzarella with friends Caitlin and Jeremy. See that stuff on the left...it was milk just 10 minutes before we took this picture. Cool, huh? There are two methods for making mozz, and this time around, we opted for the easier one. Instead of carefully cultivating a culture, we used a combo of rennet and citric acid to turn a gallon of milk from Strafford Organic Creamery into lasagna fixin's. 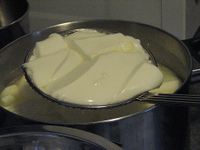 The recipe we used comes from the New England Cheesemaking Supply Company website. It's easy to find and easy to follow, so I'm not gonna write down all of the steps. They also sell all of the necessary supplies, sans the kitchen implements and the milk itself. This picture shows the stretching process. If you've ever made taffy, you'll find it's pretty similar. We ended up with 1 1/4 pounds of fresh cheese. At a nearby grocery store, the conventional, non-local fresh mozzarella goes for $7.99 a pound, so 1 1/4 pounds would cost $10. Our cost for the local, organic version: $9. We decided to increase the bang we were getting for our bucks by making some ricotta from the leftover whey. We heated the liquid to 200 degrees and strained it through a double layer of cheesecloth. Lo and behold, about 2 tablespoons of ricotta. Oh well! Luckily, Caitlin had made a batch of ricotta with whole milk earlier in the week, so we had enough for our lasagna. The remaining whey became fertilizer for Jeremy and Caitlin's vegetable garden. If you make cultured cheeses, though, the whey can also be used as a starter for making lacto-fermented veggies such as pickles and sauerkraut. I had to much fun making the cheese that I ordered some supplies for myself, so check back for more cheesy posts in the near future.